Triple H heads to the ring and quotes “Sympathy for the Devil.” He says that if Roman Reigns forgot and thought there would be retribution for when he attacked Triple H last year, then he was mistaken. He shows footage from RAW where Triple H breaks Reigns’ nose. Good match. It immediately broke down and everyone entered the ring when Barrett, who started the match, went to attack someone on the apron. The League dominated the chaos in the brief segment before the break. After the break it was more of a regular match with the League dominating, but the babyfaces started to come back. The last segment of the match was nice and exciting. Neville pulling off a 450 splash over Sheamus’ head was probably the best moment. Good finish too. It was a little messy and short, but it worked for what it was. Bubba basically caused a distraction then the ref and Jey awkwardly stumbled around so they couldn’t see Bubba shake Jimmy off the ropes. Recap of the return of Shane McMahon on RAW. Jericho tells Styles that he didn’t like him at first, but that they have good chemistry as a tag team. Styles agrees and says he wants a Wrestlemania moment, even as a tag team champ. Tonight they have a match with New Day and need a partner. Mark Henry volunteers. He doesn’t like people who act funny and play around. The Godfather has been announced as the newest inductee into the WWE Hall of Fame. Not bad. 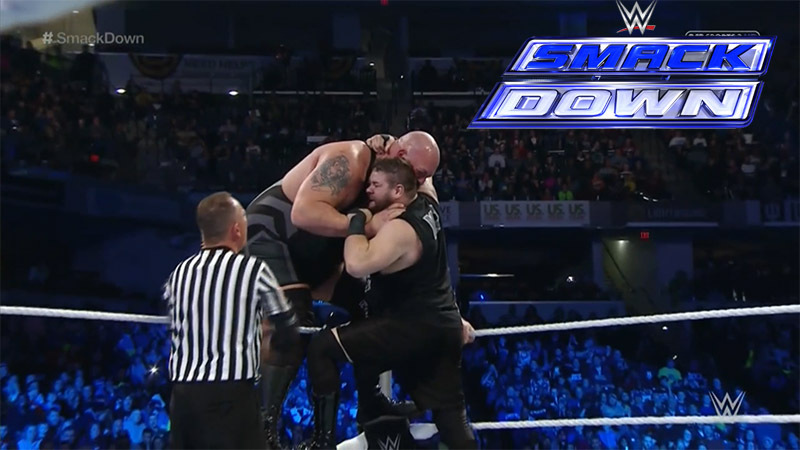 Big Show didn’t move a lot, but he and Owens worked well together. Big Show made a questionable decision, but like Lawler said during the match, “bad decisions make great replays.” The replay here wasn’t great, but it was good. And it involved “scrambled eggs” as Ranallo put it. It was a promising match until the interference. Natalya and Lynch were going well and trading moves with Natalya hitting a nice release German suplex. Then Naomi and Tamina came out. After the match Naomi and Tamina attack Becky, but Sasha comes out to help fight off her former allies. Charlotte then comes out to the stage with Ric Flair. She informs Becky and Sasha that their number one contender match will be on RAW this coming Monday. Good match. They both took the match pretty seriously and the involvement of Goldust was very well done. This was a very good continuation and development in the Golden Truth story. R-Truth seemed to finally start to come around to the idea, the Goldust winked at him and R-Truth felt weird again. I like it. Recap of Ambrose arriving in an ambulance on RAW, challenging Lesnar to a match at Wrestlemania, and getting beat up again. New Day heads to the ring and talks about the foul, nasty, moist mess of a tag team that is Y2AJ and Mark Henry. They question whether or not Henry is still the world’s strongest man. Woods then poses. New Day says Y2AJ isn’t even a real tag team. Not like New Day. Very good match. It had a lot of fun moments with both teams having some jokey moments, but it was a serious match with a good build to it. It grew to a pretty fast pace and even managed to show the growth in the relationship between Styles and Jericho when Jericho took a shot to save AJ from getting hit as the legal man in the ring. All around, very good. Yeah, this was a very entertaining show. Stories were furthered both in the ring during matches and outside the ring. I really, really like it when they can effectively further a story with matches like they did here. There were some new combinations in the ring as well which is always nice to see, and the wrestling was generally good and fun to watch. Overall this was easily the best match. It had the best in-ring progression out of all the matches, it helped further a story, and it was fun. You can’t ask for much more than that. The eight-man tag had some cool moments, but it was a little more rushed and uneven, which is only natural since the main event had a little more time to develop.